The lifeblood for all helical distributorships are the hard-working installers, who put the steel into the ground. Good installers are not only building their own business through their dedication and quality workmanship; they also help the Distributor to build their business because the reputation of the helical contractor is as important, if not more so, than that of the manufacturer and distributor. At Danbro, we have an expression regarding the pursuit of good installers: “You have to kiss a lot of frogs before you find your prince.” Over the years, Danbro has been blessed with a lot of princes, but few more princely than Dennis Funk of East Coast Remodeling. Dennis is retiring from the helical business, so I sat down with him to thank him for his positive contribution to our industry and asked him about his helical journey. East Coast was also at the head of the curve with the emergence of the Environmental Remediation business in New Jersey. Buried, rusting oil tanks were leaching contaminants into the sandy, loamy soils in NJ and the DEP required the tanks to be pulled and the contaminated soil removed and replaced. 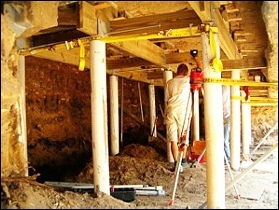 Helicals replaced temporary concrete pilings as they did not require the remediation contractors to mobilize multiple times to do the work piecemeal. They now could install sleeved, grouted helicals to support half of the structure, remove the contaminated soil, backfill, and repeat the process on the other half of the structure. Dennis and Joe were among the first to recognize this potential and helped to establish the acceptance of the use of grouted helicals above grade, ground-breaking (no pun intended!) stuff at the time. For a decade or more from approximately 2000 to 2010, thousands of helicals were installed during the heyday of this industry in NJ. “East Coast Remodeling left its mark in its twenty-five years in the helical installation business,” stated Danbro President Frank D’Angelo. “They repeatedly demonstrated that the lateral/buckling bad rap that helicals often got, could be easily neutralized with a grouted helical pile. We want to thank them for their contributions to our business, but more importantly, for their contributions to furthering the acceptance of helical technology.” They, along with our other installers who were doing this work, were trailblazers and deserve to be recognized for their significant contributions to the wider acceptance of helicals.